Safe yourself time by using a freeware to capture any part of your screen in any size. It even allows you to save it directly to your defined format (*.jpg, *.gif, *.png, *.bmp etc). 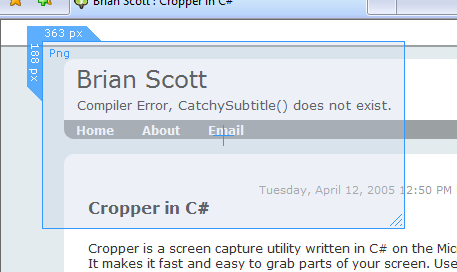 I’ve used Cropper in every screenshot for my blog and I’m glad that I have found such a useful too. – Use it to easily capture parts of a web site, including text and images. It’s also great for writing documentation that needs images of your application or web site. – The files are saved straight to a folder of your choice in the format you specify or to the clipboard or printer. No more ‘Print Screen’… open image editor… paste from clipboard… crop… export. Just double-click the form or press enter, and whatever is visible below the form is captured. * You will need at least .NET Framework 2.0 to be able to run the software. * It’s even open source!